Several people have made 3-axle versions of the regular smart fortwo. Considering the platform is the same, we shouldn't be surprised by this new contraption. OK-Chiptuning, a German firm, gives us the walkaround. Stock, the car came with the 61 PS version of the 0.7-liter turbo engine, which has been upgraded to 85 PS and 135 Nm of torque, about the same as the current Twingo 0.9 TCe. So it's neither slow nor fast. The second axle, the one at the back, probably isn't connected to the drive shaft, considering it would eat up so much of the power. But you could almost call this a pickup since it has a lift-up fiberglass cover and storage for lots of really thin things, like suitcases. There's also a second trunk at the front, just like a Porsche Cayman... a Porsche Cayman kit car that is. 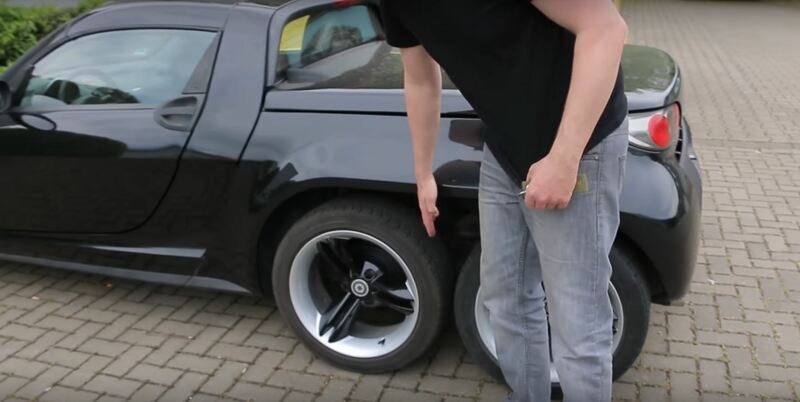 As if six wheels weren't going to grab enough attention, the roadster also comes with Lambo doors. Given the addition of the smart is now technically a mid-wheel drive car. Unfortunately, we don't know enough German to understand how that affects its handling characteristics. But it's still got TUV certifications and looks that will gather crowds at any car meet. The roadster's electrically operated convertible roof remains intact, which is amazing considering you can buy one for beer money. If this were out project car, we'd do even crazier attention-grabbing things, like a chrome wrap, fender flares, and a huge rear wing. Maybe even an engine swap, considering the roadster used to be available as a limited-edition 1.4-liter V6. I think that is very unique and cool. 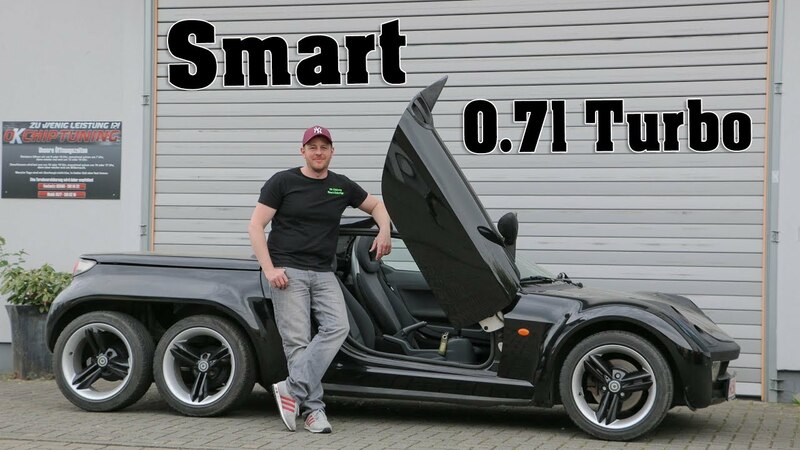 Well I owned the Smart Roadster (with boot and soft top), and I can tell you that the boot (trunk) is very limited to what it can hold, so this is an improvment, LOL! 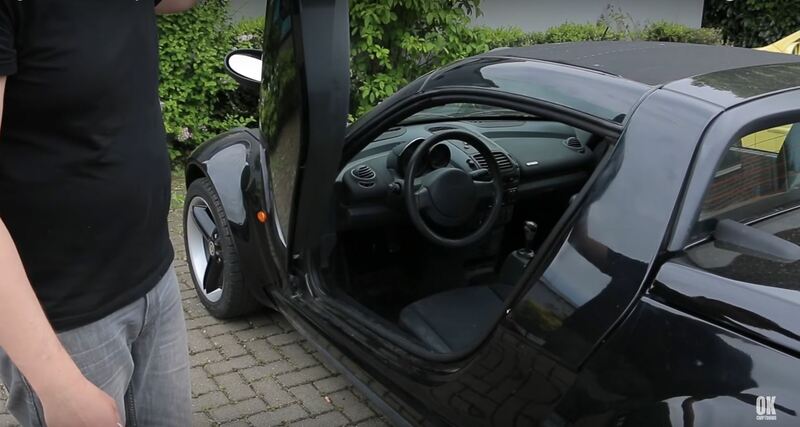 I got rid of my Roadster after the warranty ran out (two years), as they are very bad at letting in rain water, from roof, front bulkhead, speakers in the doors, and door mirrors. Mine leaked from all of these locations and could stand the damp no longer, so sold it. I have owned three Fortwos now (450, 451 and now 453), and never has such trouble as my Roadster. Pity, as it was great to drive.